When you’re at the bottom, things can only get better, right? Wrong, at least if we follow the pessimistic view of Gary Oldman’s directing debut, Nil By Mouth. Centered around an unstable South London family, Nil By Mouth is swarming with disjointed characters, shots and mise-en-scene, and grotesque dialogue, which ultimately confines the viewer into a violent and filthy world. 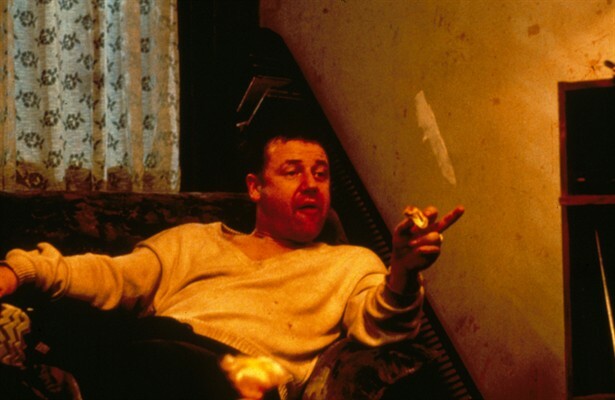 It is in this world that we see the disastrous lives of Ray (Ray Winstone), Valerie (Kathy Burke), Billy (Charlie Creed-Miles) and the people around them. From the first shot we are bombarded with packed visuals, zigzagging lines, people move negatively across space and often blocking of our point of view. This is the method that is followed throughout the film. The claustrophobic, smokey scenes filled with juxtaposed, non-linear objects not only promotes a sense of disorder but also an unsettling nausea. This can be reflected not only by the films audience, but its characters alike. Each character is deprived of control; control over themselves, their loved ones, and even the environment around them. This is where the conflict in the film derives from, each character needing to gain control for whatever reason it may be. For Ray, it is control over his wife. For Valerie it is control over herself. Both are unobtainable. The film is a masterpiece of acting and cinematography, and what I would regard as British gem.